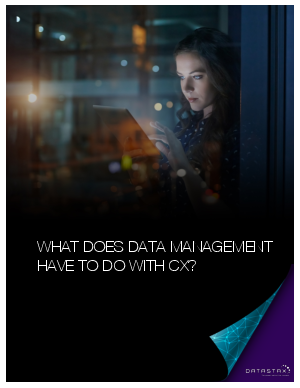 > Datastax > What Does Data Management Have to do with CX? Companies are in a race to set themselves apart from the competition in a meaningful way. Pre-Internet and pre-cloud, beating the competition meant out-advertising them, out-spending them, out-maneuvering them, or getting to a certain demographic before they did. Today – it means using data to connect with the customer on a meaningful level. Connection breeds loyalty, which breeds recurring revenue. A huge marketing or advertising budget won’t help you much if you’re not able to connect with your customer IN THE MOMENT – to capitalize on what the customer is doing right now.